An artist's rendition of Ares I being stacked in the vehicle assembly building at NASA's Kennedy Space Center in Florida. 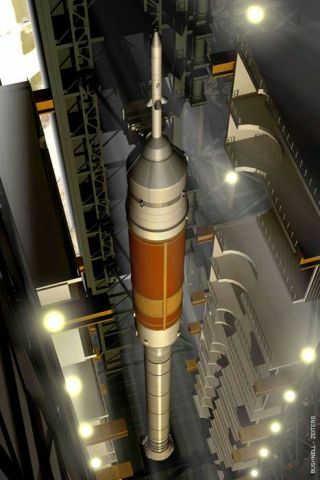 Houston-based Boeing won NASA's contract to built the rocket's upper stage, which appears in orange below the conical Orion crew capsule. WASHINGTON? NASA announced Tuesday that it has selected Houston-based Boeing SpaceExploration to build the upper stage of the Ares I rocket the United Stateswill use to launch astronauts into orbit after the space shuttle retires. Boeing beatout Brigham City, Utah-based ATK Launch Systems and its teammates LockheedMartin Space Systems and Pratt & Whitney Rocketdyne to win its first majorpiece of the new launch system. The $514.7million cost-plus-award fee contract runs through 2016 and covers themanufacture of a ground test article, three flight test units and sixproduction flight units. The Ares I upper stage will boost NASA's plannedshuttle successor, the OrionCrew Exploration Vehicle, into orbit. Boeing?steammates on the program include Hamilton Sundstrand, Moog, Northrop Grumman,Orion Propulsion Inc., SUMMA Technology Inc., United Space Alliance and theUnited Launch Alliance. Had Boeinglost the upper stage competition, it would have had only one more shot atgetting a piece of the multibillion dollar new launch system ? a roughly $300million contract NASA expects to award in December for the rocket?s avionicssystem. Boeing is among a half-dozen companies competing for that work. NASA?sselection of Boeing is a disappointment for Brigham City, Utah-based ATK LaunchSystems and its teammates Lockheed Martin Space Systems and Pratt & WhitneyRocketdyne, the only other team to bid for the Ares I upper-stage contract. However,ATK and its teammates already have major pieces of NASA?s space shuttlesuccessor. In earlyAugust, ATK signed a $1.8 billion contract August for the Ares I rocket?s mainstage, a derivative of the solid-rocket boosters it builds for the shuttle. InJuly, Pratt & Whitney Rocketdyne concluded a $1.2 billion deal with NASAfor the design, development and testing of the J-2X engine that will power AresI?s liquid-fueled upper stage. And last August, Lockheed Martin Space Systemsbeat out Boeing and teammate Northrop Grumman for a nearly $4 billion contractto build the Orion Crew Exploration Vehicle, the six-personcapsule designed to launch atop Ares I. Most ofBoeing?s upper stage work will be performed at NASA?s Michoud Assembly Facilityin New Orleans. Lockheed Martin currently uses the facility to manufacturegiant external fuel tanks for the space shuttle. The Ares I upper stage, whilesmaller than the space shuttle external tank, will be much larger than anyupper stage in service today. NASAexpects to conduct its first orbital flight test of the Ares I rocket in 2013and start using the vehicle to transport astronauts to the International Space Stationno later than March 2015. The finished rocket is expected to lift 55,000 pounds(25,000 kilograms) to low Earth orbit.